Just after I wrote the SfSB blog post, Mom arrived with another block (the one on the right). I had forgotten to take a photo of the one she made last week, so here they both are. We are up 26 now! Want to help? I am thrilled at how many people are making a block or two. Do you want to contribute some blocks? Contact us through our blogs for mailing instructions. Thanks very much for your generosity! I have been expecting some blocks from Chris and SherriD. I was gratified to find them in my mailbox today! We are getting quite a little collection. We now have 25 blocks. 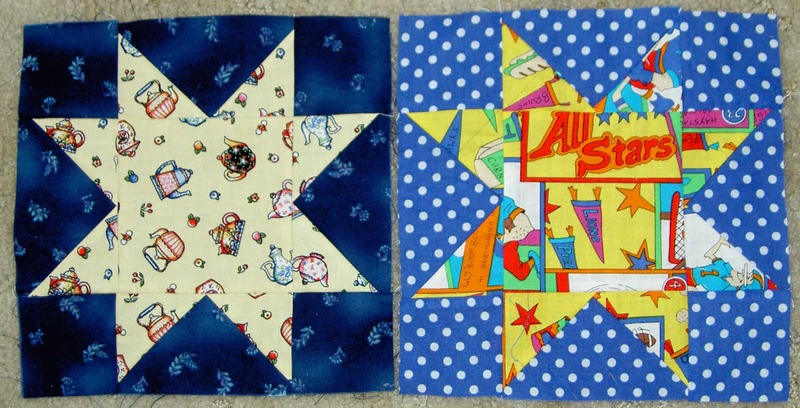 I think 5 more and I could make the 3 quilts. 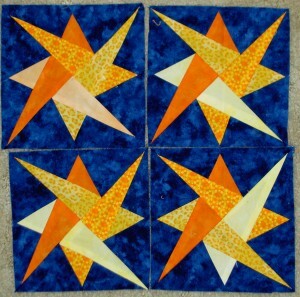 I would like more blocks, because some of the blocks are small, but I could make the quilts with 30 blocks total. Chris is the first one to do applique’ and I really like her blocks. They are very friendly looking. 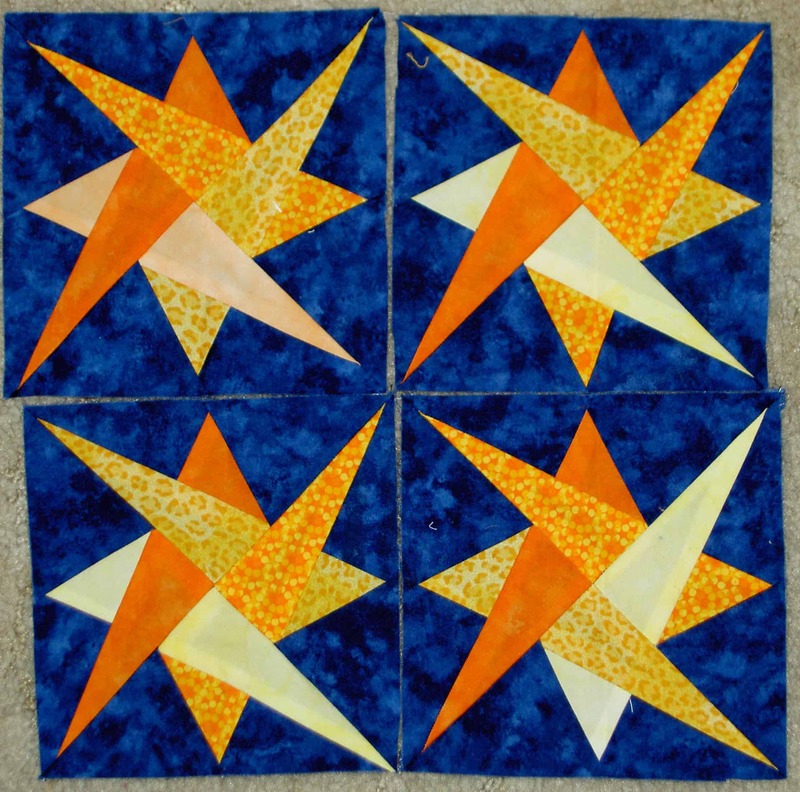 I hope I get at least one more applique’ block so each quilt can have one. 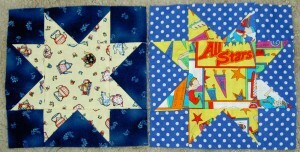 7 more would be ideal ;-), then I can put 3 applique’ blocks in each quilt. 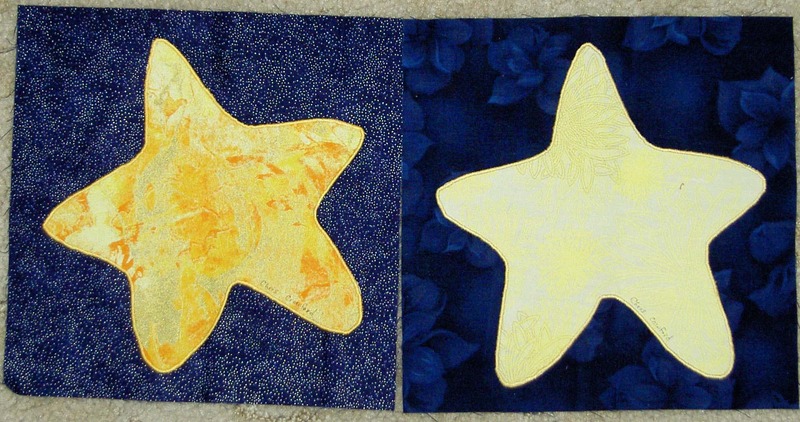 The background on Chris’ blocks is exactly what I was imagining for this quilt. I met Chris when she came to CQFA and then we met up at the Modern Quilt Guild meeting as well. She has a great blog. She writes very thoughtfully and had some interesting posts about design classes she has taken recently. I am planning on bringing my Around the Block book, some dark blue fabric and some yellow fabric so people can make some blocks at an upcoming retreat I am attending. I hope they will take the opportunity to sew. I am going to get the Young Man to make a block, too. He refuses to sew, but I am thinking he could paint and then I could print the star on fabric. I haven’t done it yet, but it is on my mind. I may assign that task to my mom.